From the many crane resources worldwide we've selected some of particular interest to Ozcranes readers. Here in Part 1, we include world cranes, organisations, and crane surveys. Resources 2» covers farms, wetlands and conservation; Resources 3» presents galleries of cranes in flight; and Resources 4» links to libraries and downloads. Crane art and cultural resources begin with Crane Art 1». The International Crane Foundation (ICF) leads and collaborates in many crane research and conservation projects worldwide. The site has extensive information about cranes, conservation projects and research, a significant digital library, photo gallery and kids pages. For more on ICF crane work around the world, and links to other major crane organisations, visit Our Work or ICF's Site Map. The IUCN (International Union for Conservation of Nature) has a searchable library, with resources on cranes and wetlands. A free online book The Cranes, pdf 8MB (Meine and Archibald 1996), covers status and conservation for all 15 world crane species. A full update by the IUCN Crane Specialist Group, including Australian members, will be published in 2017. 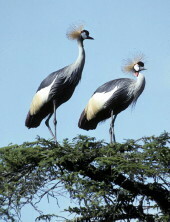 The IUCN Red List is also a significant resource, search for full conservation status details on any cranes species. 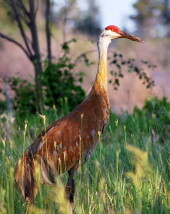 Patuxent Wildlife Research Center (US) provides free download for the book Cranes: Their Biology, Husbandry, and Conservation, ed. Ellis, Gee and Mirande, 1996. The full pdf is 8.5MB, or chapters can be downloaded separately. Just some of the long term crane surveys involving local communities worldwide. Methods vary according to the species, habitat and local conditions. For example, the long-running Midwest Count for Sandhill and Whooping Cranes in the US, surveys early morning roosts by call and sight, with counters using judgement to exclude repeat records of the same birds. The North Queensland Crane Count for Brolgas and Sarus Cranes surveys exact numbers of cranes as they fly into evening roost sites, by sight only. This method was chosen because early morning counts in this environment miss many birds leaving for daytime feeding sites before light, or in dense mist. Blue Crane Anthropoides paradisea, chicks and egg.